Children love to tattle, especially on their siblings. To every mom’s dismay, it’s hard for children to discern when tattling is necessary. 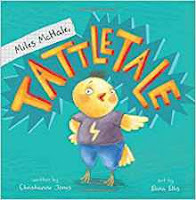 I recently read MILES MCHALE, TATTLETALE by Christianne Jones, art by Elina Ellis. Miles Mchale is a frequent tattletale at home and at school. The teacher can’t take it anymore and holds a contest. Whichever team tattles the least for one week, wins a prize. With the help of a pledge, the children learn when it is okay to tattle. But, even with the pledge, Miles doesn’t understand when to tell and when to keep silent. Not only is he causing his team to lose, his friends are upset with him. He decides no more tattling. When his sister takes a cookie and gets hurt, he needs to decide is this a tattle or telling moment. And has he learned the difference in time for his team to win? I think this book is an excellent teaching tool, the explanations are kid friendly, the pledge is easy for kids to understand and remember, the characters are animals with personality and the kids will enjoy the tattling situations. At the other end of the spectrum, there are children who are quiet and shy. This can cause parental angst. FUCHSIA FIERCE by Christianne Jones, illustrated by Kelly Canby is a story about a fearful child who prefers living in the shadows. 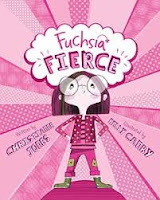 Fuchsia Fierce is not a bold child, but quiet, shy, tiny and timid. Her parents send her to Confidence Camp, but she makes up excuses why she can’t participate in swimming or climbing a wall or telling a story. Fuchsia finds camp boring while the other kids are having fun. At the next activity she decides to join in. Her friends are supportive, and she feels emboldened to try new things. She tells her parents what she has discovered about herself, things that she is good at and things she needs to work on. She is still quiet, shy, tiny and timid, but learns she can be brave, strong and fearless. And learns being tiny is not a bad thing and even has its advantages. I think this is a wonderful book for the shy child. I also like the subtle lesson for the parents. For example, when Fuchsia refuses to participate in climbing a wall, she is given the responsibility of helping with the equipment. With each activity that she refuses to do, she is given a task related to that activity. The child doesn’t feel left out or different or ostracized. She learns she can still participate while gaining confidence. Love that!